Life is interesting. 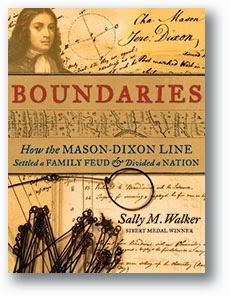 Several months ago, before I knew about Boundaries by Sally M. Walker, I stumbled across an article on NationalGeographic’s news site “Saving the Mason-Dixon Line” by Bijal P. Trivedi. Written in 2002, Trivedi writes of how two present day surveyors have spent over ten years locating and documenting each and every stone laid by Charles Mason and Jeremiah Dixon during the years 1763-67. The stones that mark this infamous boundary, after 200 years, are weathering, damaged, vandalized or missing altogether. You can imagine my delight to then find a book, by Sally M. Walker, no less, that would give me the history on the creation of the Mason-Dixon Line and some background information on the men who completed this scientific feat. As Walker explains in her introduction, The story of the Mason-Dixon Line encompasses many different boundaries, some hundreds of years old. The history of this line begins with a country, the religious persecution of its own people, and a fierce property dispute. The book is well documented, and though it explains what led up to the decision to create a clear boundary marker between Pennsylvania, Maryland, and Delaware, Walker does an excellent job explaining the scientific method the surveyor’s used to ensure the boundary was accurate. Complementing the text are many historic photographs. Sidebars are distinguished from the main text by placing the words in italics. The inclusion of an author’s note, index, source notes, bibliography, and index make this an excellent example of quality nonfiction. Boundaries is a great addition to units studying American History or Astronomy. Listen to the song, Sailing to Philadelphia that Mark Knopfler wrote after reading Thomas Pynchon’s novel, Mason & Dixon. I love Sailing to Philadelphia! This book looks great!